Back in November, when House Speaker Paul Ryan and President Donald Trump were selling the massive decrease in corporate taxes they wanted, they promised it would have huge benefits for workers. Cutting taxes for companies “will directly drive up wages for our workers,” Ryan predicted. Trump “put a number on it, saying a typical American would see a $4,000 raise if the corporate rate was reduced to 20 percent from a high of 35 percent today,” as the New York Times reported. The Milwaukee Journal Sentinel reinforced that narrative, with a story touting a $1,000 bonus given to employees by American Family. The story didn’t note that American Family is accused of cheating its agents of as much as $1 billion in retirement benefits, while company executives saw their pay rise 12-fold. Worse, readers had to go to the jump page, 20 paragraphs deep into the story, to learn how few companies are actually giving anything more to employees. Just 39 of the top 500 American companies were giving employees financial rewards, and just eight of those were increasing wages. Most are handing out one-time bonuses, with no long-term gain for workers. The total cash or stock-based enhancements given to workers totaled $1.7 billion, the story found, compared to an estimated $75 to $100 billion less in annual taxes these companies would now be paying. That’s about two percent of the gain going to workers this year, with no guarantee of any more in the years to come since it’s a one-time handout. “It’s a drop in the bucket,” as Nick Sargen, chief economist at the money management firm Fort Washington Investment Advisors told readers in paragraph 27, the second-last graph of the story. Rather than devoting any serious money to better pay for workers, companies have spent most of their windfall on buying back their stock. “Such purchases reduce a company’s total number of outstanding shares, giving each remaining share a slightly bigger piece of the profit pie,” as the New York Times explained. And the chief beneficiaries of this are wealthy shareholders and corporate leaders. Middle and lower-class Americans own little in stocks; the richest 10 percent of American households own 84 percent of all stocks, the story noted. By mid-February, companies had “announced about $170.8 billion in stock buybacks, the most ever for this early in the year,” as CNBC reported. But the huge break for companies “repatriating” or moving overseas cash back to the U.S. at a bargain basement corporate tax rate of 14.5 percent is expected to result in the top 500 U.S. companies buying back $450 billion in stock, as Bank of America predicted. None of this should have surprised Ryan or the Republicans. Prior to the tax plan’s passage, companies had predicted it wouldn’t lead to higher wages but to stock buybacks, mergers and acquisitions, and investments in automation. The idea that in a properly functioning capitalist system companies will suddenly lavish money on workers because their profits are up, would have amused Adam Smith. Their goal is to maximize profits. All the more so in today’s economy, where corporate leaders are rewarded for cutting jobs and wages, which has driven CEO pay to a level 347 times higher than that of the average worker. If Ryan and President Trump were serious about reforming taxes to help workers they could have cut taxes on the middle class and expanded the earned-income tax credit for poorer workers. This would have assured that 100 percent of tax benefits went to workers, rather than a tiny percent of it. But the real goal of the tax plan was to reward the super rich, the same people who increasingly provide most campaign donations. The percent of all campaign donations coming from the wealthiest 0.01 percent of Americans has risen from 15 percent in 1980 to 40 percent in 2016, a recent study found. It’s hardly a coincidence this group will get the lion’s share of money from the Republican tax plan. As the overwhelming evidence of who was benefitting from the plan became clear, Ryan gave it one more try, with a tweet touting a $1.50 per week hike a secretary got from the tax plan. That compares to the estimated annual gain of $11 million for President Trump, winning national ridicule for Ryan. Republicans, meanwhile, we’re finding their ads touting the tax plan weren’t working. In the special election recently won by Democrat Conor Lamb in Pennsylvania, about two-thirds of the ads for his opponent talked about taxes. Over time that dropped to 36 percent of the ads, then 14 percent, then zero, Politico reported. The ads simply weren’t working. When the rich are getting billions and average Americans are getting peanuts, even the most ingenious marketing person may have trouble selling the situation. As a working person what I get weekly is maybe 25 more per check. Can’t even cover a full tank of gas. When compared to what the wealthy and corporations are getting just means what petty scraps I get will go to subsidize them with welfare. Republicans are worthless horrible wards of government. 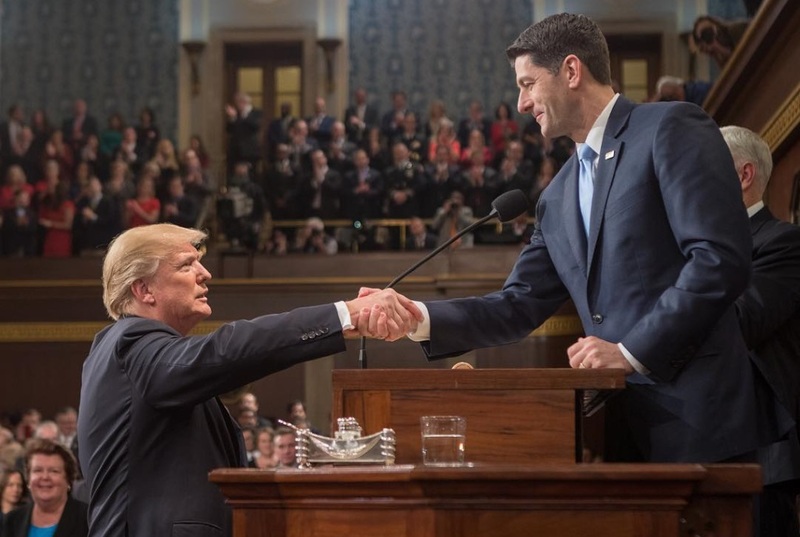 Is that Paul Ryan or Neville Chamberlain shaking Trump’s hand in that photo? Of course there are no wage gains! Meanwhile the stock market and retirement accounts are collapsing due to Trump’s trade war. Wisconsin really does not need a sycophantic crypto-fascist appeasing Trump toady representing us any longer. Enough, Paul, I mean Neville. Enough! They have not gotten cuts yet till they file taxes. with employees short we see salaries going up all over especially in wis. We are guaranteed a boom cause we are way short of housing, we need 50,000 units in next few years cause of Foxconn. Dopey Left does not understand that as we have 15,000 jobs at Foxconn, 2000 suppliers plus the boom in housing. @WCD, you are babbling incoherently again. What are you trying to say? Something about Republican dopers? Thanks for this analysis. Helpful…. He is saying ignore logic, reason, and history because this time unlike all the other times tax cuts will raise wages for the middle class and working class. I guess WCD who does not work, has no idea. FoxConn is a free market success right WCD? No taxpayer money no gubamint help! Haha….you are such a joke. No one takes you seriously because you have no principles or ethics other than power. -There has been a reduction in federal withholding. Not exactly an amount that might ” jumpstart” the economy. -Can’t wait to see what my tax preparer says for the 2017 fed/ state tax bill. -Trump must think the “average” American family has a gross household income of $ 200,000.00 (+). -Salaries not going up . -I am waiting for someone to trickle my way soon and don’t crash my 401K again. The politics of this tax debate could be interesting come November. If the Republicans past Trump tax cut #2 will Democrats vote against it. The individual tax rates for Americans will go up in 2028 to Obama 2017 levels. Will Democrats vote against the “crumbs” passed down to Americans. Wage growth is up only a little and maybe only to minimum wage laws and Tax cuts. In the end were stuck in a deflationary period which began when the boomers started saving for retirement in greater numbers. Reason #4 Government Debt- The Feds bought up Trillions of dollars of mortgage notes under Obama in away to stimulate the economy. Under Trump the Feds began to sell these notes back into the economy. Which is large unknown ?? Less money in the American economy is deflationary. Reason #5 With all the gains in technology. Most of it is in entertainment purpose (Facebook). Workers in America cannot have wage growth with out productivity. The job creators have not found ways to make their workers more productive to justify the wage increase. Troll : But business managers/job creators HAVE FOUND A WAY to give themselves significant pay increases. -What is “Trump tax cut # 2 ” ??? -What are Obama 2017 levels? You mean Trump levels following the inauguration. Eric, the left has cried that the tax cuts for individuals is merely ten years of cuts. Trump is looking to make those cuts set in stone but only receive three quarters of a loaf. He wants to put Democrats up for a vote to say no on individual cuts in stone before the November elections. Bruce is right, this is essentially what Republicans are running on. The electorate will decide thumbs up or down. I do not disagree with Bruce Murphy’s assessment currently. The cuts have been in place for one month. Business plans are set out in one, five, and 10 year increments. In both of my current jobs I have not received a wage bump. I do believe my wage will rise though because in both job situations the employer cannot find credible help. Something has to give. If your a Democrat and you want Trump to burn. It will not be a bimbo pornstar that will lead you to prosperity. It will be Trump betting big on the stock market and Americas economic future. I personally am a huge Trump fan but his achilles heal is the stock market and taking credit for some of its pretend wealth affect. If your in the market beware. Cash is king. The individual tax cuts are set to expire in ten years -Corporate cuts not –Why is that ?? Democrats didn’t invent that. -Trumps problem is that he is in over his head. Hire & fire on a regular basis . No ability to staff his presidency with competent people. -The ” bimbo’s” are Donald & Melanias problem. -Some ” businessman “/ manager . Troll is well trained in groveling to his economic masters for the small scraps it gets. My company gsVE ME big raise cause of that. Bruce, how about you. Country, middle class runs on jobs, not redistribtuion and welfare as the nutty socislists want. They drove KC out of Wis. and thousands of businesses to China to make them rich while food stamps spiraled and welfare. These programs are bringing back jobs raising employment reducing unemployment and in Wis. lowest in history 2.9%. Compare that to what Earl and Doyle did to what Tommy and Scott did. People, businesses are swarming into Wis and Foxconn, greatest business deal in our history will mean 50,000 jobs a new city in SE Wis, making wis the Midwest center of tech. Left prefers more welfare and food stamps..
W.C.D. : Nice pipe dream . What have you been smokin’? -State government doesn’t have enough $$$$$$$ to buy back many more jobs . -” businesses are swarming into Wis ” ??? Where ? Care to offer some facts ? -Isn’t Wisconsin attempting to lure residents and new college grads to stay ? -If you reduced all the welfare payments and food stamps to zero it wouldn’t be enough to pay for transportation / roads / educ. investment / state subsidized healthcare etc. etc. -Wasn’t there an economic depression underway at the end of the Bush ( REPUBLICAN) presidency? Has the left not read that a trillion dollars is coming back to this country this year. Those dollars do not go back in a safe. Those dollars are the lifeblood to public and private union pension. How else will one retire to Florida at 60 years of age and run a smoothie stand for the next twenty-five years. @Russion Troll, we just lost trillions more in market value just this week alone due to The Idiot Trump’s asinine return to tade wars, tariffs and mercantalism. He is now creating his “war cabinet” by bringing back the Walrus himself John Bolton. As Mueller’s noose tightens The Idiot Trump will launch WWIII rather than let collusion be proven. You watch. His entire life is a fraud and a scam. How low will fascists like yourself go to put party before country? Answer, very, very low.You should be ashamed. Fact is idiots: The Money from Foxconn is from future income generated by Foxconn, not from present roads or school aids. If Foxconn had not come we would never have received any of that income. Lefties on this site are both liars and totally ignorant. They hate jobs for people cause they will stop voting for their socialist ideas that was stifled in Wis under Doyle who lost 130,000 jobs after 8 years compared to Scotts 230,00 plus and Tommys 750,000 plus. This during eh 8 years of Obama recession and several recessions during Tommys reign. Terry, a Ford Focus in Europe built in the USA is slapped with a tariff four times greater then the US taxes a German VW wagon. If you want to do business in China you must partner with a Chinese company. Your company must also share your research and development secrets with the Chinese. The Chinese then take your technology and compete against you. Also, if you want to see the new big tent movies such as Marvel movies. They already have it on DVD without Disney’s permission. @Russian Troll, having the greatest economy the world has ever seen is a hell of a thing huh? Well at least it was. Enjoy your third world Foxcon government subsidized jobs while you can suckers. @WCD, hey moron, you’re pathetic jobs numbers are laughable compared to my home state of Washington, the most progressive state in the country which ALSO happens to have the BEST economy of ALL US states year after year after year. Even “socialist” Minnesota, Massachussetts, California, Oregon, New York etc (basically any blue progressive state) literally run circles around your low wage, no benefits, government subsidized regressive third world economy in Walker’s Wississippi. Thus it is YOU and other Republicans that are in reality, the idiots. You can always tell the poor Potheads when they are writing here. doesn’t change the FACT basically any blue progressive state literally run circles around your low wage, no benefits, government subsidized regressive third world economy in Walker’s Wississippi. Thus it is YOU and other Republicans that are in reality, the idiots. the third-most populous county in Illinois. Its county seat is Waukegan. Lake County is the 31st richest county by per capita income. Naval Station Great Lakes is located in the city of North Chicago in Lake County. It is the United States Navy’s Headquarters Command for training, and the Navy’s only recruit training center. Super Blue Progressive County Government, Hillary Clinton won it handily in 2016. Big companies bought the race track site. @WCD, you’re right. They are the only ones that make any sense. The “wage gains” are in the same place corrupt Career Politician Scott Walker’s 250k jobs are, nowhere, because they don’t exist and never will. That’s why Walker tried to buy some low wage no benefits Chinese manufacturing jobs instead of building a real economy. No worries, when we dump Walker in November we can embrace the free market for the first time in eight years and end the failure of cannabis prohibition, legalize tax and regulate cannabis and create 18,000 new good paying jobs, collect 100 million in new tax revenue annually which is currently going straight to the black market, save millions in criminal justice reform and create a much more free, equitable, egalitarian society in the process. Latest released figures for Wisconsin, on front page of Journal, growing from the 2010 Recession that Doyle had us in, with way over 10% unemployment, lost 130,000 jobs in 8 years, the Scott’s to 2-9% unemployment lowest in our history, need more employees a record for Wis.
Amazon, Foxconn has produced a boom in state. Thank you Scott and forget these chattering Jaybirds on this site with their dopey ideas. Foxconn is a scam . Foxconn is scam only to those still trying to cover up fro the failure of the Doyle gang that lost hundreds of thousands of jobs, and Barrett who has the highest unemployment, 59% in his city, for youth. NY TIMES wed. Tax breaks to companies to get jobs is bad deal, but in so many cases the only option. Racine has lost half of its manufacturing jobs since 1970 and options are not on table for them or inner city of Milwaukee.